What differentiates us from our own competition? 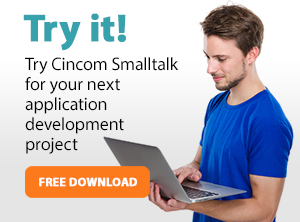 What’s the advantage in using Cincom Smalltalk? For each type of software development, Smalltalk cuts the complexity that complicates software development while accelerating your potential for profitable growth. This simple development tool helps you create value at the lowest possible risk and assures you of the fastest return on investment. Simply possible. Cincom Smalltalk makes the hard things easy and the impossible, possible. Producing systems for internal clients can be a challenging task. Built atop decades of applications and a variety of technologies, new systems must bridge practices and data structures from other eras. Plus, they must be accessible on the web. Cincom Smalltalk simplifies development, assuring that new or integrated applications for internal clients deliver the value and return on investment at low cost and low risk to you.Cincom’s implementation of Smalltalk requires no compromises. You focus not on the code you’re writing but on the business processes you want to automate. Your application reflects your professional expertise, not merely your coding and debugging skills, and you produce a higher quality, higher value application. The total cost of ownership is more than the license charges. When you can create applications with little or no support, when they can be applied straightforwardly across diverse platforms, when you can write them quickly, you save money. Your costs are lower than with other application tools.If you can save time and money developing applications because the tool is easier to use, your return on investment the ROI increases. How much more will your ROI increase if at the same time you can integrate systems and data more quickly? Productivity–In studies and comparisons, Cincom Smalltalk is consistently more productive than any other mainstream language. Simplicity–The language design is simple, consistent and efficient, allowing users to get more done with less. This means fewer problems and less maintenance for our users. It also means that users can get their arms around more complex problems. Pioneering–From Smalltalk’s heritage at the legendary PARC labs, to modern development techniques, Cincom Smalltalk’s technology has and is setting standards. From the graphical user interface, to XP/Agile development, people using our technology are continually making or influencing software development. Portability–Cincom Smalltalk is a leader in platform portability, which minimizes risk and protects the user’s development investment while getting the platform flexibility they need for their applications. Broad Application Flexibility–Cincom Smalltalk has proven successes with Client, Client/Server, Web Browser, Web Server and Distributed applications. Enjoyment–Developers using our technology get more done and enjoy doing it. Better morale leads to better employee retention.